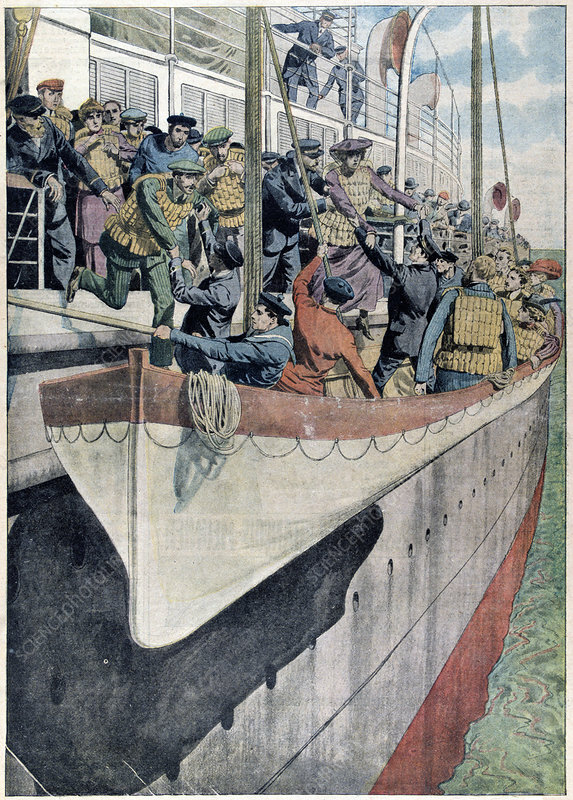 The lesson of SS Titanic: Lifeboat drill on a passenger liner, 1912. Operated by the White Star Line, on 14 April 1912 SS Titanic struck an iceberg in thick fog off Newfoundland. She was the largest and most luxurious ocean liner of her time, and thought to be unsinkable. In the collision five of her watertight compartments were compromised and she sank. Out of the 2228 people on board, only 705 survived. A major cause of the loss of life was the insufficient number of lifeboats she carried. Better provision of lifejackets and lifeboats began immediately after the disaster. From Le Petit Journal. June 1912).